In the 35th Annual Prize Distribution Function of Rajkiya Kanya Mahavidyalaya (RKMV), Chief Minister Virbhadra Singh announced Rs. five crore for the construction of new complex of Arts and Administrative Block of Rajkiya Kanya Mahavidyalaya (RKMV), Shimla. Foundation stone of this block was laid by Virbhadra Singh during previous tenure on 9th August, 2007 but the previous Government had diverted the funds allocated for the block elsewhere and work on this project was stalled. Chief Minister said that this college had rich legacy and had produced some of the best students who had contributed in different spheres of life. Congratulating the meritorious students who had secured top ranks in academics besides sports and various co-curricular activities, he said that their achievements would inspire other students to excel themselves in various fields. He congratulated the Principal and staff members of the college for getting best out of their students. 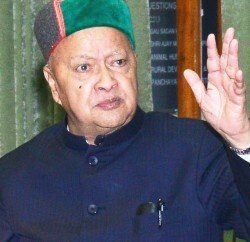 Virbhadra Singh said that the State Government was contemplating to establish a Skill Development Corporation with an initial investment of Rs. 500 crore, which would help in checking unemployment on a large scale and would provide ample employment opportunities to the youth in the industries being set up in the State. He said that a Skill Development Authority would also be constituted in the State and efforts would be made to create at least five lakh job opportunities during the next five years. He said that since press was regarded as the fourth pillar of democracy, the State Government would Open University of Journalism and Mass Communication at a suitable place in the State. 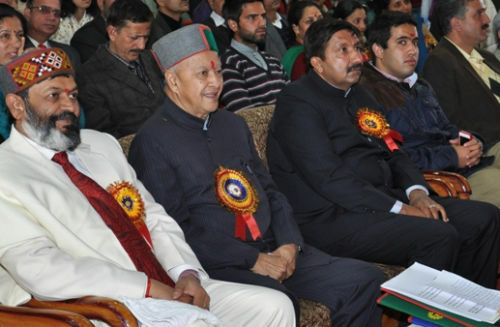 Virbhadra Singh said that State Government was according utmost priority to the education sector and efforts were being made to provide ‘State of the Art Education’ facilities to the youth of the State near to their homes. He said that the State was spending about Rs. 962 crore on Higher Education during the 12th five years plan and added priority was being given for construction of buildings in government colleges and schools by spending Rs. 74 crore during the current financial year. Chief Minister said that the State Government was laying special emphasis on education of girl child which has resulted in better female literacy in the State as compared to other parts of the country. He said that at present out of 74217 students studying in government colleges, 45156 were girls, which was more than 60 percent. 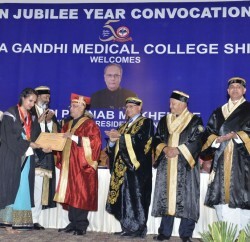 Gross Enrolment Ratio (GER) of Higher Education in Himachal was 23.9 percent, while at National level it was 15 percent. Our target was to take it to 35 percent by the year 2020, he said. Chief Minister said that soon after assuming power, the State Government decided to reopen all those 149 Government Schools which were de-notified during previous Government’s regime. 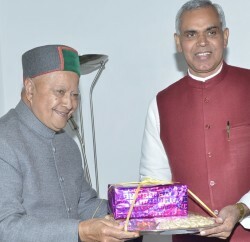 He said that the State Government had also decided to provide free travelling facility to all the students of government schools from home to school and back, in Himachal Road Transport Corporation (HRTC) buses from 1st April, 2013. Chief Minister directed the district administration to identify suitable parking place for RKMV at circular road to facilitate the students and teachers of the college. He said that lady police constable would be deployed in the college campus during college hours to ensure safety and security of the students. He also announced deployment of regular pharmacist and lady health worker in the college. Chief Minister distributed prizes to various meritorious students excelling in education and other co-curricular activities. Principal of RKMV Prof. Meera Walia while presenting the Annual Report detailed various activities and demands of the college. She said that Chief Minister Virbhadra Singh had always laid special emphasis on education especially on girl education. She said that it was during his Chief Ministership that Himachal Pradesh became first State in the county to provide free education to girl child upto graduation level including professional courses. Director Higher Education, Dinkar Burathoki proposed vote of thanks. Industries and Information & Public Relations Minister, Mukesh Agnihotri, MLA Anirudh Singh, Mayor MC Shimla Sanjay Chauhan, President, Himachal Pradesh Sports, Cultural and Environment Association Vikramaditya Singh, Vice Chancellor, H.P. University Dr. A.D.N. Bajpayee, Member Executive Council, H.P. University Harish Janartha, Councillors, MC Shimla Archna Dhawan and Inderjeet Singh and senior officers of the State Government were present on the occasion among others.